My doctoral thesis (1995) was revised and published by Routledge in hardcover, in 1999, as the 25th volume of their Studies in the History of Economics series. During the 2000s Marx’s Concept of Money was issued as an eBook and, due to continued demand, released as a paperback in 2014. Recently, Routledge selected this work for inclusion in the Routledge Historical Resources: History of Economic Thought online platform of resources for students and academics, giving them ‘access to the best and most relevant book and journal content from Taylor & Francis, on the particular subject that each covers and to facilitate searching for outstanding resources clear and easy’. Fastidious in its detail, it carefully reconstructs all the obvious textual sources and hints scattered through Marx’s project … Nelson’s book mirrors Marx’s great work, in that it pursues something closer to structural analysis yet issues less expectedly in political urgency … book-ended by a sense of ecological crisis … Nelson’s is a valuable contribution. Peter Beilharz (2001) ‘Book review‘, Thesis Eleven 67: 122–27. 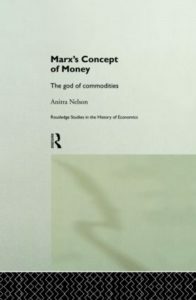 This is a highly interesting book that seeks to challenge Marx’s analysis of money both in respect of both the notion of commodity money and his dialectical method used to analyze money. Nelson’s work is commendable to the extent that Marx does utilise a commodity theory of money (when a fuller understanding of money and credit was in order), and when his dialectical method does lead him into blind alleys. PA O’Hara (2000) ‘Money and credit in Marx’s political economy and contemporary capitalism‘, History of Economics Review 32: 83–95. The thesis was very well received by its three North American academic examiners, and by reviewers for Routledge (London) who had urged publication. The examiners had agreed that the work was ‘impressively comprehensive’ and its literary presentation ‘excellent’. They commended it for taking ‘definitely a fresh approach’ and observed that it ‘pushes significantly beyond the existing literature’. One of the publisher’s reviewers was ‘very enthusiastic’ — Alan Freeman (then at University of Greenwich) said the work ‘has the potential to establish itself as a reference’. Pre-publication orders surpassed half the first print run. Review article by PA O’Hara (2000) ‘Money and credit in Marx’s political economy and contemporary capitalism‘, History of Economics Review 32: 83–95. CJ Arthur (2001), ‘Book review’, Capital and Class 73: 181–82.